Acoma Pueblo and Sky City Cultural Center - a feast for all of the senses. Cheryl Alters Jamison prepares one of the recipes featured in this article on the New Mexico Style Show. As it comes into view on the main access road to the Pueblo of Acoma, the mesa-top earthen village of Sky City rises primordially toward the heavens. It’s one of New Mexico’s most compelling sights, and even more so once you get to the ancient settlement. A patina of perpetuity cloaks the deep-ochre adobe homes, one- to three-level structures hard against winding dirt tracks, all leading to the soaring 17th-century San Estebán del Rey Church. The Pueblo is so committed to maintaining traditional ways that it forgoes electricity and running water. Only some 30 of the estimated 5,000 Acoma tribal members live on the mesa full-time, but nearly all Acomas flock there on feast days, when visitors are also warmly received. A couple of summers ago, two West Coast food journalists let me know they were coming to New Mexico for a conference I was also slated to attend. When both mentioned September 2 as one of the dates they would be here, I knew we simply had to visit Acoma’s annual Feast Day honoring San Estebán, the Pueblo’s patron saint. In addition to the promise of the extraordinary setting, the stunning annual harvest dances, and related ceremonies, the trip offered the chance to check out the new Sky City Cultural Center and its Haak’u Museum. Our entourage had a special invitation to stop by the ancestral home of Aleta “Tweety” Suazo and her family. Tweety’s longtime career in New Mexico education has made her a respected figure in the state, but it’s her reputation for hospitality and good home cooking that brought us to her door on the sun-drenched mesa top. Like other Acoma families, the Suazos had spent days preparing special foods: chile stews, beans, tortillas, broccoli-grape salad (a newer Pueblo tradition but a tradition nonetheless), and Tweety’s thin-crusted dried-plum and apricot fruit pies. Some dishes were brought from the Suazos’ other home, in Rio Rancho, but much was prepared at Acoma, as it has been for generations, without the contemporary conveniences we take for granted. Our group had some of every dish. What filled us up most, even more than third helpings of fruit pies, was the family’s warmth. You don’t have to be tight with Tweety to take the Feast Day shuttle up the mesa and soak up the reverent, joyous events in Sky City. All respectful guests are welcome. (See sccc.acomaskycity.org for information on attending this year’s festival.) Food is for sale outside many of the homes, from sublime frybread to the simply strange Kool-Aid pickle. A Southern American oddity transferred to some of our Pueblos, the pickle is pretty much what it sounds like: a hefty dilled zeppelin soaked in fruit-flavored liquid, usually red. When we returned to the mesa’s base, we marveled at the striking, monolithic cultural center. The building’s contemporary design pays homage to the Pueblo’s ancient architecture, as well as that of Chaco Canyon and Mesa Verde. The façade incorporates stacked stone and stucco in varied earth tones, and the entrance’s massive pivoting doors replicate those in the mesa-top church. Both the permanent and rotating museum exhibitions chronicle the Acomas’ history and showcase their art, especially the elegant hand-coiled pottery, emblazoned with trademark geometric designs painted in white, black, and dusky red. The gift shop/gallery offers pieces to take home, created by the Acomas and other Native Americans. While in the cultural center, we had to glance at its Y’aak’a Café. All of us liked what we saw. However, even professional eaters have to sometimes exercise restraint, so after all the feasting atop the mesa, we simply read the menu. The regular fare could be described as modest, but looked enticing. Ever since, the simple café, with its big views and covered patio, has been on my breakfast and lunch road-food radar. I recently caught up with Native American chef Jon Harris, who took over the kitchen early in 2012. Harris, half Diné on his mother’s side, spent his early years in Phoenix. After a series of restaurant jobs as a young man, he attended culinary school at the Art Institute of Phoenix, and went on to work in the kitchens of Wright’s at the Arizona Biltmore and the Inn at Little Washington (near Washington, D.C.). His mother, Lena Kee, relocated to Acoma to work at the community’s medical center while Harris was accumulating his post-graduate culinary experience. After his mother developed some health problems, Harris, now 36, moved to the Acoma area to be closer, then linked up with Y’aak’a Café. The café’s cuisine focuses on classic Southwestern Native American specialties, pork and lamb stews and chilis, and ethereal frybread—which is harder to find around the state than you might think. Chef Jon says the frybread-wrapped burger, available with green chile and cheese, is the most popular specialty with Acoma residents and visitors alike. He doesn’t dare change it, but elsewhere in the menu, he’s trying out incremental new touches, like making high-tech bacon powder to sprinkle over the sweet-potato fries, or swirling smoked paprika into the bean pot. The café’s a real oasis, and would be worth a stop even without the surrounding magnificence of Acoma Pueblo and its Sky City Cultural Center. Cheryl Alters Jamison is New Mexico Magazine’s contributing culinary editor. Read her blog at www.nmmagazine.com/tastingnm. Think of those unfortunate folks out of state who consider stew to be simply a winter dish. 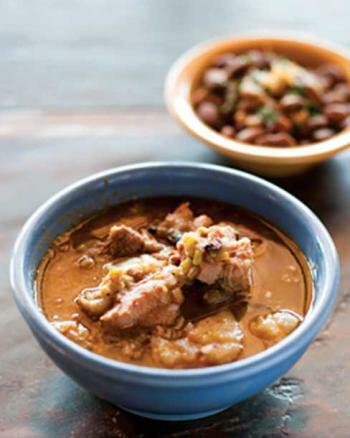 What better time to eat green-chile stew than as the season’s crop begins to come in? Melt drippings in Dutch oven or large, heavy saucepan over medium-low heat. Stir in onion, cover pan, and sweat onion several minutes, until onion softens and becomes translucent but has not begun to brown. Add pork, raise temperature to medium, and cook until pork has lost its raw color. Sprinkle flour over pork and stir to combine. Continue cooking several more minutes as pork gives off liquid and blends with flour to make a thick liquid. Pour in stock, and scrape mixture up from bottom to loosen any browned bits. Add chile, salt, and herb sachet. Reduce heat to low simmer and cook uncovered 1 hour. Stir in potato and cook another 45 minutes to 1 hour, until pork and potato are tender and flavors have blended together. Discard sachet. Ladle into bowls and serve hot.